During Nintendo's "Blue Ocean" period two console cycles ago, a variety of once niche and unique genres were suddenly thrust into the spotlight as gaming's reach expanded further than ever before. On the Wii and DS, anything could be sold as a game, from brain exercises to cooking manuals to whatever the heck Wii Music was. 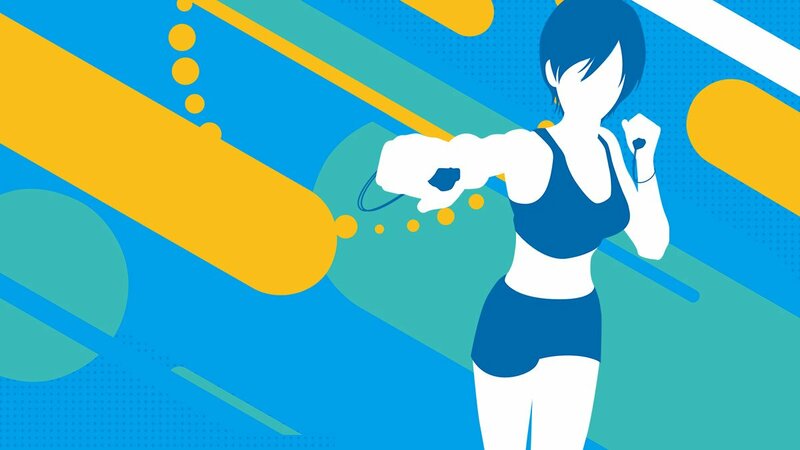 Arguably the biggest fad to come out of this era were fitness games, ushered in by Wii Fit. That game is no doubt the title most associated with exercise games from the era, but it wasn't the best in the genre. As somebody who spent a lot of money on fitness titles in a desperate bid to finally conquer his weight issues, I went through several before I found EA Sports Active NFL Training Camp. Nearly every day for three months, I would wake up before work and get in my daily NFL Training Camp routine. Where Wii Fit forced players to decide which workouts they wanted to do, Training Camp did all the thinking for me. I just turned it on, put on the "Total Body Tracking" equipment, and tried to keep up. 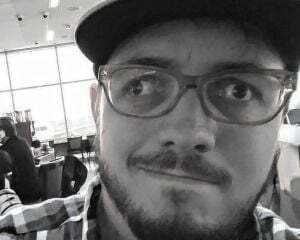 Combined with a healthy diet, I ended up losing 30 pounds with that game. That was eight years ago. The weight I lost has returned with a vengeance. Gym memberships don't really do much for me without an expensive personal trainer, so when I saw Fitness Boxing for the Nintendo Switch, I thought it might be my chance to once again get my health in order. I want to make it clear right off the bat this isn't a normal review. I'm not just reviewing Fitness Boxing as a game, but rather as a program to promote and improve physical fitness. I have been using this software for a month now and have been tracking both my exercise in the game as well as my diet. Every trainer I've spoken with in the past has told me weight loss is 90% diet, so I left it in the gloved hands of Fitness Boxing to handle that other 10%. The central concept of the game is boxing to the rhythm. Players start by picking a trainer and taking their initial fitness test. This is a short series of punches just to see where a player's fitness level is at. 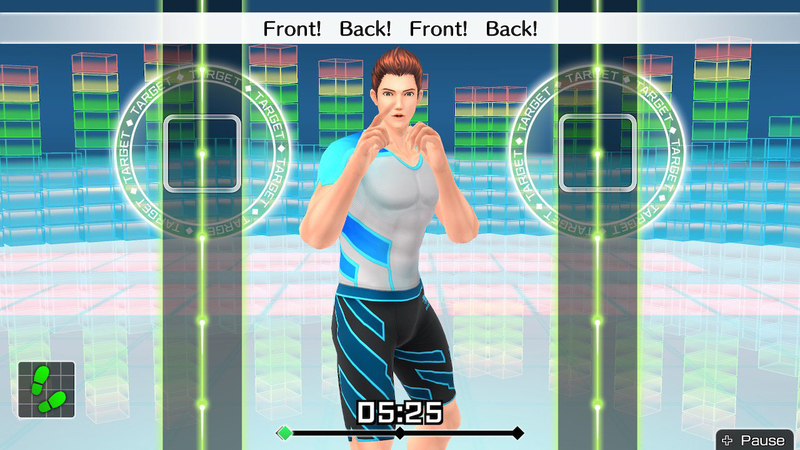 Fitness Boxing uses a "fitness age" much like Wii Fit, but it's something I don't put too much stock into given how your "age" is defined solely by how well you time your punches to the prompts on the screen. After going through that initial fitness test, players will be able to set their daily training goal. You can choose cardio, strength and cardio -- which is what I choose -- or maintenance. After selecting that, you can set your desired duration, opt to include or exclude stretching, and decide if you want to work on specific body parts or go for a full-body workout. These training sessions are made up of two or more different routines that have you shift your stance halfway through so you're not working one side of your body more than the other. A standard routine will have you take your stance, steadily introduce the different moves you'll be asked to pull off during it, and then finish with a string of combos that ties all the moves together. 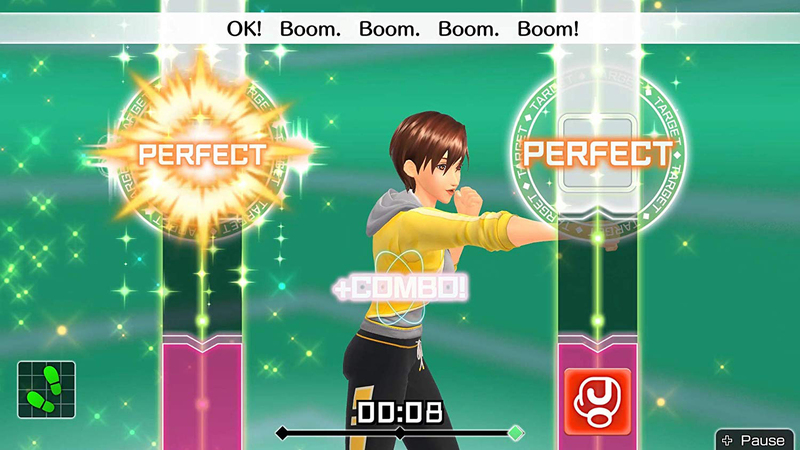 As you play, you'll unlock exercises, outfits for your trainer, and each of the 20 available songs in the game. These are not the actual songs but rather instrumental versions. So if you hate Maroon 5 or LMFAO, you don't need to worry about hearing their voices during your workout. You will have to worry about figuring out what your weight is in kilograms as Fitness Boxing does not use pounds to track how much weight you lose. Outside of your daily session, there are a variety of different free training options if you choose to work out further. You can sort exercises by type, song, or by which part of your body you want to target. 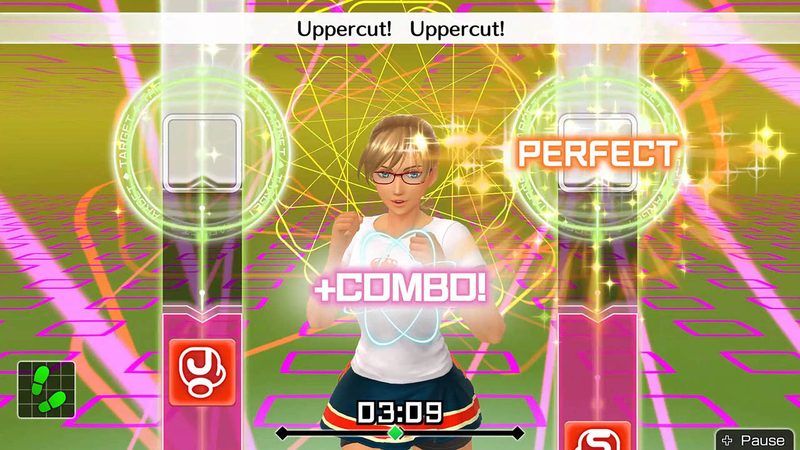 You can also practice all of the different punches and moves in the game or work out with a friend using the two-player modes. As I couldn't find anybody to work out with, I won't be covering those latter options. My first day with Fitness Boxing was not a good one. I didn't realize how horribly out of shape I was until I took my initial fitness test. I nearly fell down while throwing a jab, developed visible pit stains, and watched as my "fitness age" dialed up to more than twice my actual age. It certainly wasn't heartening, though it did make sense given how out of breath I get climbing up a single flight of stairs. After going through that initial workout, I tried to jump into another routine in free training and ended up quitting after 10 minutes. This wasn't going to be as easy as I thought it was because Fitness Boxing isn't here to hold anyone's hands. My absolute favorite workout in Wii Fit is boxing. Stepping off the Wii Balance Board and throwing those deliberate punches always felt great. That game slowly introduced the exercise to players. The first few boxing sessions were at a comedically slow pace. After several rounds with it, you'd finally unlock a speed that actually felt normal and natural to move to. Fitness Boxing doesn't have time for such slow nonsense. It's pretty much pedal to the metal all the time. There are two speeds, normal and fast, that can be switched when doing free training, however, even the normal speed is faster than you might think. When I saw that I'd be working out to Lady Gaga's "Bad Romance" at normal speed, I thought it would be at the actual tempo of the song. I was mistaken. Most, if not all, of the songs in the game are sped up from their original compositions. This is fine if you're somebody who is already fit and just playing to maintain their body, but as someone who is out of shape and trying to lose weight, training at the speeds of the game was like being thrown into the deep end of the pool. I couldn't keep pace. My trainer would do what he could to get me into the rhythm, but it was easy for me to fall behind and eventually I started ignoring the music and instead kept my eyes glued to the screen. This actually worked out for me. Instead of treating the game like it's Guitar Hero where I know the music and can keep time, I just watched as the prompts scrolled up the screen and timed my punches based on that. Maybe that's how you're supposed to do it, but the game really makes it seem as though I should be bouncing in time to every song. Even today, a month into the game, I'm still opting to ignore the music and just focus on the prompts. After that first day of exercise, I was beat. I woke up the next morning and my arms hurt and my back was stiff. I was able to complete my second daily workout, but that was it. I couldn't go any further. Day three was the same, but by my fourth day with the game, I really started to loosen up. My diet was already doing wonders to eliminate the feeling of lethargy I usually have to cope with, but now my arms and my legs started to feel as though they had an ounce of strength to them. For this first full week, my exercises usually consisted of no more than jabs, straights, hooks, and uppercuts. I went with the full-body exercise option for my fitness goal and these daily training sessions were really giving my upper body a vigorous workout. They also put the Joy-Con hardware through the wringer. The only way this game works is if the Joy-Con controllers are properly tracking every punch. Each controller will shake when it registers your movement, so it's easy to know when the game tracks a punch too early. This happened to me a lot, as did inadvertent presses of the Home button that would completely throw off my flow. Things didn't improve until I figured out how the game wanted me to throw a punch. Straights and jabs are simple enough but hooks and uppercuts need to be done in a full, fluid motion. My early uppercuts were quite jerky and it wasn't until I smoothed those out that Fitness Boxing started to register them as perfect. For my first full week, I stuck with a 15-minute daily exercise. Starting the second week, I pushed it up to 25 minutes and immediately hit a brick wall. One week of boxing didn't get me in shape and while I was spending more than a half hour playing during a few of those first seven days, the time was spread out with a lot of rest in between. I still couldn't go a full 25 minutes straight, so I had to knock it back down to 15. By this time, my list of available exercises had grown. No longer just throwing punches, the game had me dodging as well using the Joy-Con controllers. To my surprise, these moves registered perfectly every single time. Maybe I was just getting better at knowing what it wants from me, but seeing all my non-punching maneuvers land perfectly was certainly a confidence booster. At the end of my second week, I was starting to actually look forward to working out each day. This is also when I started seeing some of the benefits of exercise start to develop in my body. As I started my third week with Fitness Boxing, my arms were noticeably stronger. When I flexed, I could just make out the outline of a bicep. Going up a flight of stairs at the train station each morning didn't leave me wheezing like an asthmatic and my back hurt less and less as time went on. In my third week, I switched back to a 25-minute workout and was able to make it through without giving up. Clearly, this game, along with my diet, was starting to change my body for the better. Even if I didn't lose any weight or as much weight as I anticipated, spending three weeks with Fitness Boxing had dramatically improved my health. I was still overweight and my clothes still fit poorly, but I no longer felt like I was somebody on the cusp of having a heart attack. After three weeks with it, I felt great, and here at the end of week four, I feel even better. I've had to endure a lot of little annoyances to get here, but it's worth it if I feel healthier than I did in all of 2018. As I said at the top of this review, I wanted to play Fitness Boxing for a month to truly assess how well it can work as a fitness game. At the beginning of this experiment, I set myself on a meal plan that would have me lose one pound per week just by diet alone. On day 30 of this extended review, I weighed myself and found I lost seven pounds.